White Pepper is black pepper which has been soaked to remove the outer husk. It is hotter and less fragrant than black pepper. It is one of the most versatile spices, particularly used in European cooking so as to not blemish creamy white sauces with black specs of pepper. The spice people carry these pepper products ; pepper black whole, pepper black ground, pepper black cracked, pepper white whole, pepper white ground, pepper green whole, pepper lemon, pepper mill mix. White Pepper is black pepper which has been soaked to remove the outer husk. It is hotter and less fragrant than black pepper. 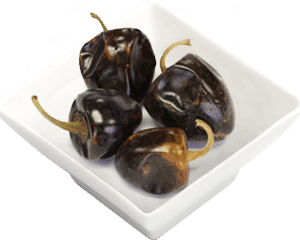 Pepper White is one of the most versatile spices, particularly used in European cooking so as to not blemish creamy white sauces with black specs of pepper. The whole peppercorn is great to use in grinders. Pepper is used in all cultures and all types of cuisine. Also, it is known for improving the digestion. It is great when accompanied with other types of pepper such as in our Pepper Mill Mix. 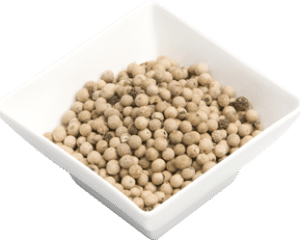 White pepper has a different flavour profile than black and can be more floral and complex in flavour. This means it is rare that in a recipe that calls for white pepper one can substitute with black, so for best results use white pepper when called for. Mix with salt to create an all-rounder seasoning for all kinds of dishes varying from sauces, stews and roasts. It is common in Chinese cooking, and also used in aromatic Vietnamese soups and pork dishes, as well as in many Swedish dishes. Use the peppercorns whole for an intense burst and texture or grind them down into a powder to mix seamlessly into dishes and dressings. Due to its subtle citrus notes it is ideal ground and mixed with olive oil and lemon juice for a zesty vinaigrette. It can be used similarly to black pepper, especially in light and white dishes for aesthetic reasons. Use it in small quantities in sweet preparations. Pepper has Piperine compounds that improve the digestion and calms nausea. Also, it is known to have anti-inflammatory, carminative, anti-flatulent properties.